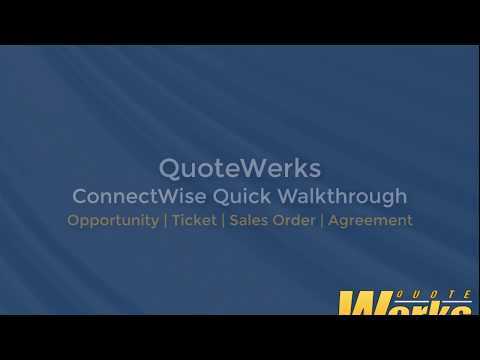 QuoteWerks enables you to reduce your quoting time from hours to just minutes. Use your iPad or HTML5 compatible tablet to create quotes while on the go. 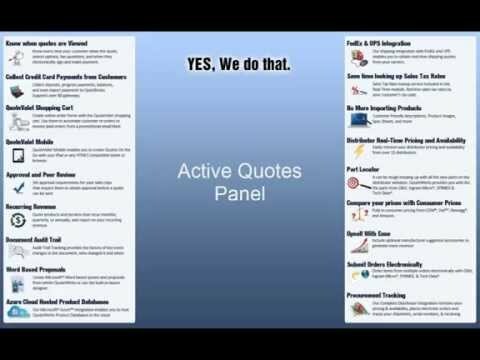 John Lewe, President, Founder, and Lead Developer of QuoteWerks, talks about the need for quoting software. All business need three core software applications. CRM, Quoting, and Accounting software. 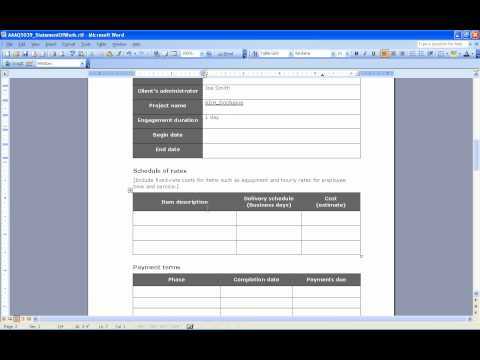 In this video we discuss the untapped benefits in implementing quoting software. It is important to know what kind of company you will be working with. John Lewe, our President, talks about the company he has built. John Lewe, President and Founder, discusses how he first encountered the need for quoting software and how he invented QuoteWerks back in 1993. 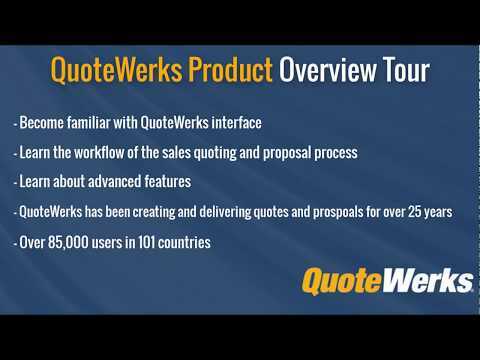 Today QuoteWerks is the market leading sales quoting and proposal software serving over 66,000 users in 101 countries. 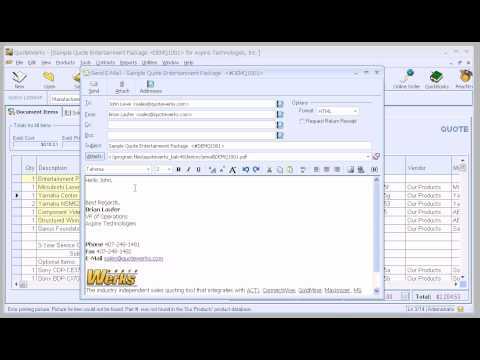 Demonstrates the QuoteWerks integration with ACT! for Web. 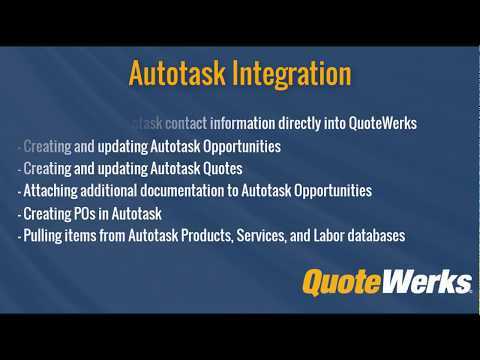 Demonstrates the QuoteWerks integration with Autotask. 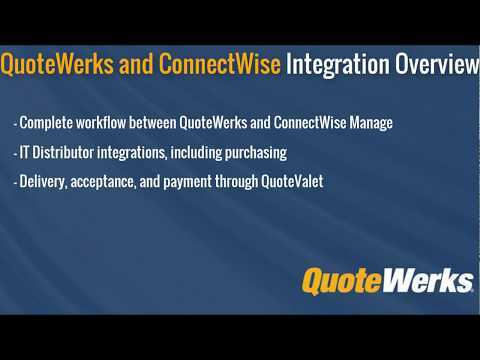 Demonstrates the QuoteWerks integration with ConnectWise. 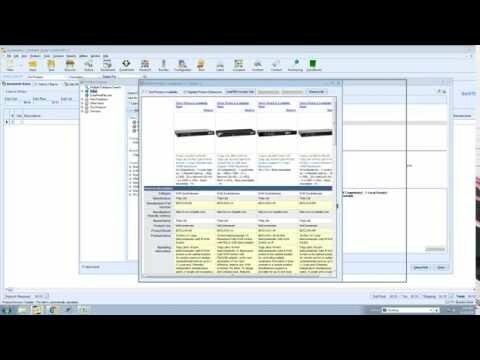 Quick Overview of Opportunities in ConnectWise including creating Agreements, Sales Orders, and Tickets. 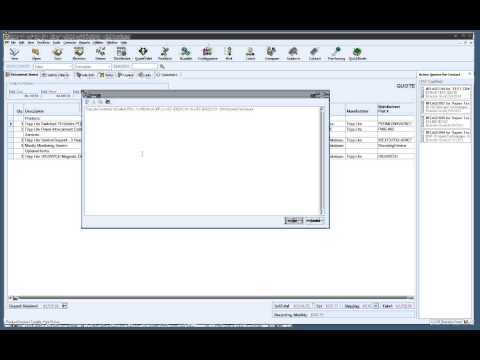 Demonstrates how to setup the QuoteWerks integration with ConnectWise. 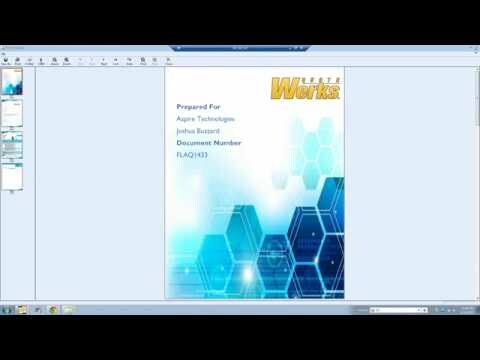 Demonstrates how to create an API Member in ConnectWise to be used by QuoteWerks. 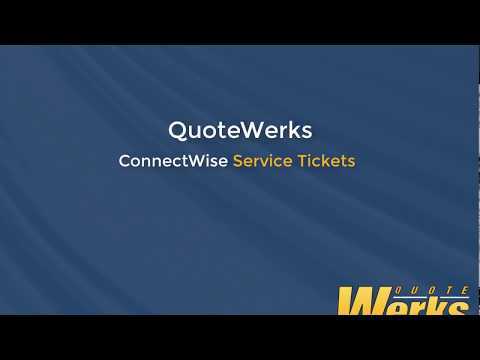 In this video we introduce you to creating Service Tickets within ConnectWise via QuoteWerks. In the Joes Brewing Printer example, a total of 3 tickets are created. The first ticket is created during the quoting process for the Accounting department to negotiate better rates with a distributor. After the quote it won in QuoteWerks, we then create a ticket for service and a ticket for all of the products. 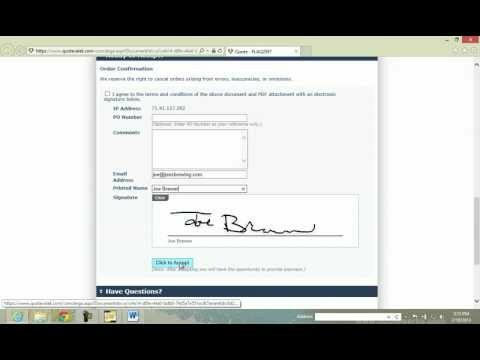 Demonstrates the setting up and using Agreements with ConnectWise. 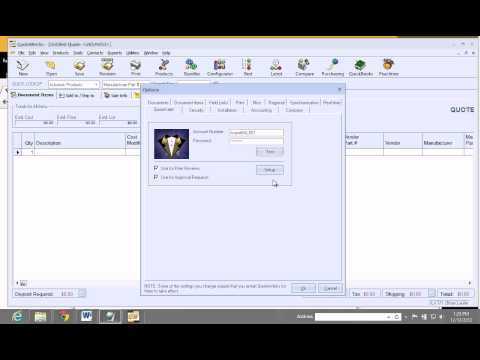 Demonstrates the QuoteWerks integration with GoldMine. 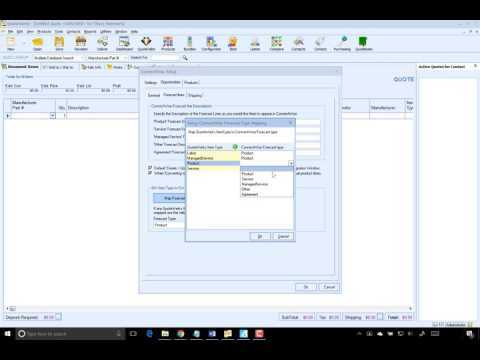 Demonstrates the QuoteWerks integration with Microsoft Dynamics CRM. 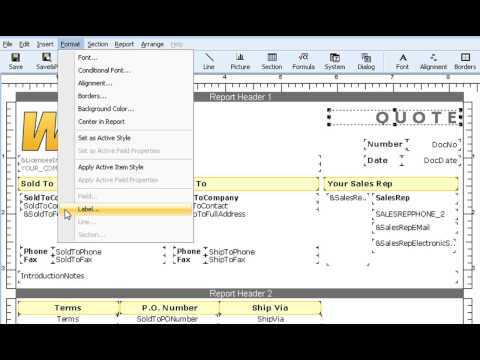 Demonstrates the QuoteWerks integration with Microsoft Outlook Business Contact Manager (BCM). 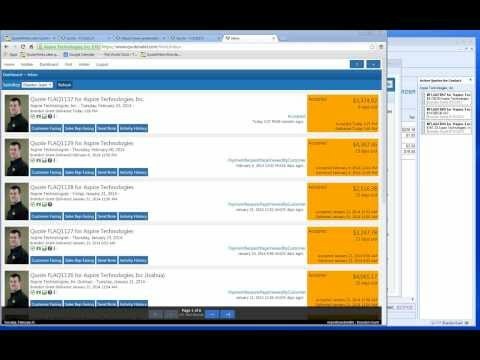 Demonstrates the QuoteWerks integration with salesforce.com. 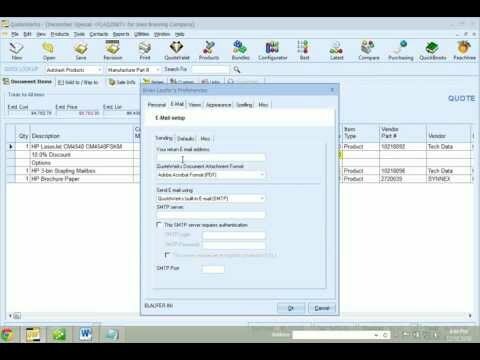 Demonstrates how to use the Datalink feature to pull additional field information from your contact manager into QuoteWerks such as Terms. Learn more about QuoteWerks Web. 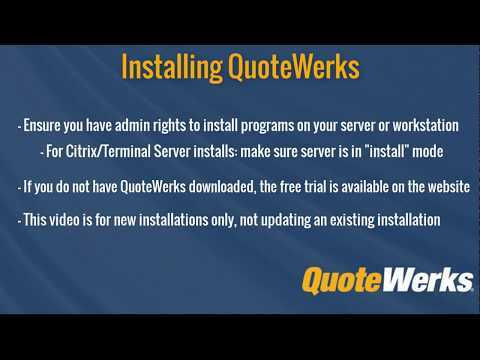 This step-by-step video walks you through downloading and installing QuoteWerks (both a local installation and a network installation), including how to enter license keys and do your initial basic setup. 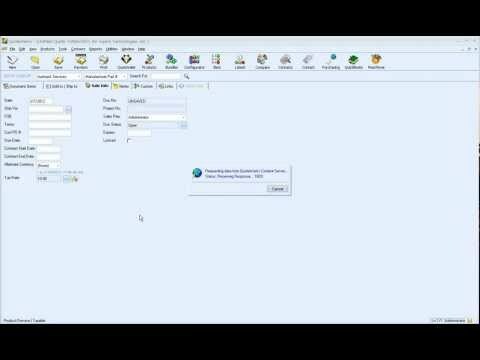 This short video will walk you through how to find and open QuoteWerks after it has been installed. 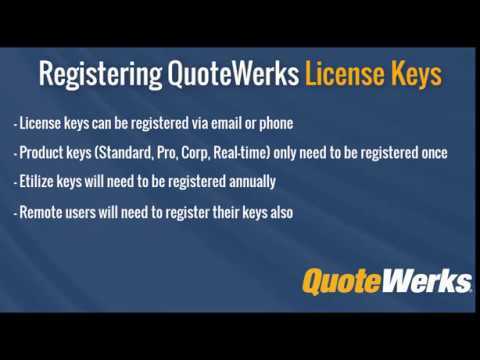 We will also show you how to add license keys to QuoteWerks and how to log in after keys have been added. 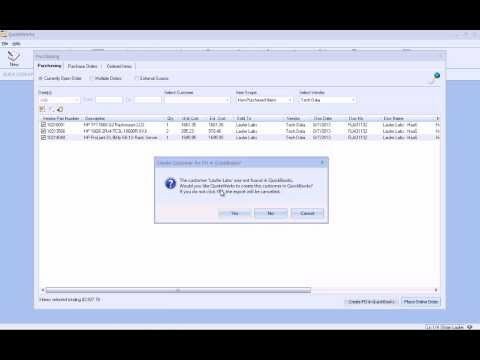 In this video, you will learn how to setup QuoteValet in QuoteWerks for the first time. This includes entering QuoteValet Tenant Credentials, Uploading your company letterhead, using Sales Rep Pictures, and more. 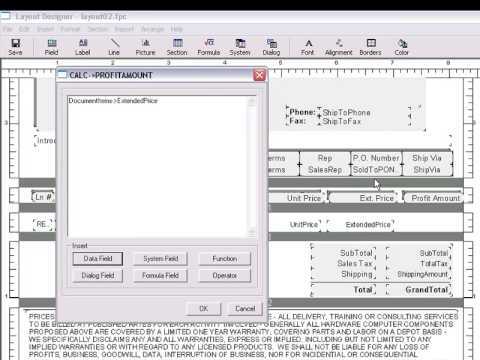 Demonstrates how to create quote templates on QuoteValet Mobile. 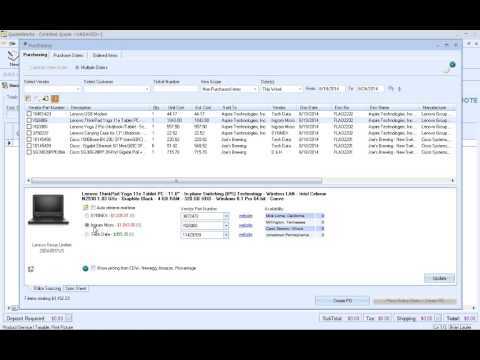 Demonstrates how to use and setup QuoteValet Insight. 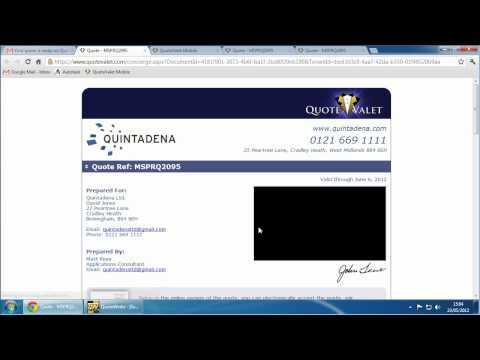 Demonstrates how to Setup and Use written signatures with QuoteValet templates. 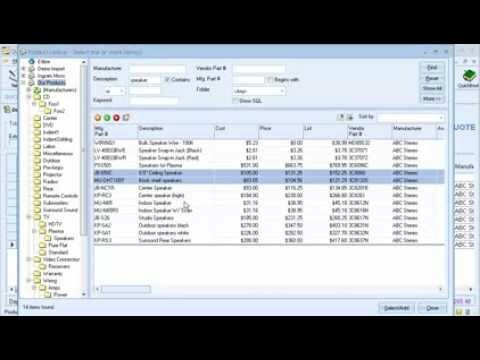 This short video will introduce you to QuoteValet - Modern Quote Delivery. 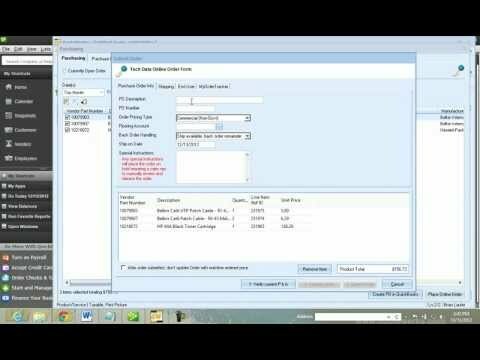 Demonstrates how to import products using the Product Import Wizard. 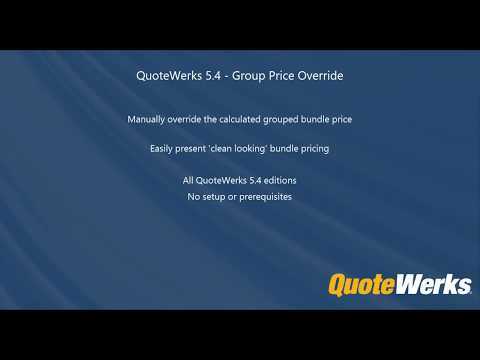 Demonstrates the different types of bundles in QuoteWerks and how to setup and use them. 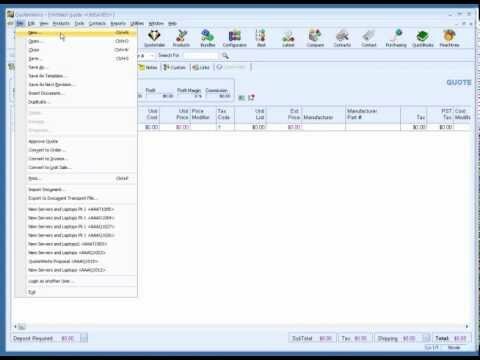 Demonstrates the different types of configurations in QuoteWerks and how to setup and use them. 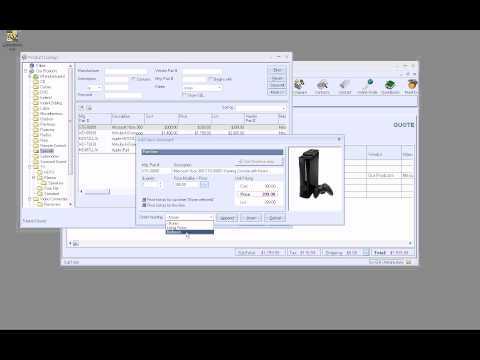 This video builds upon the basic Configurator Basics video adding advanced features such as when to use product, navigation, and default branches.. 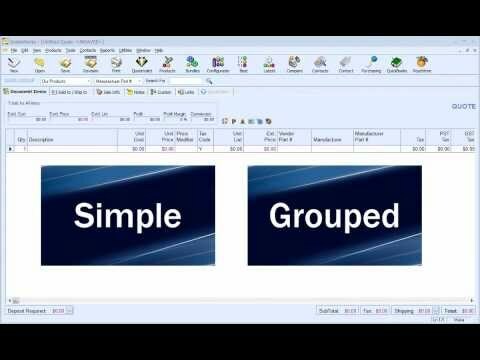 Demonstrates how to create, link to, and removing product data sources through the Products|Setup Product Sources menu. 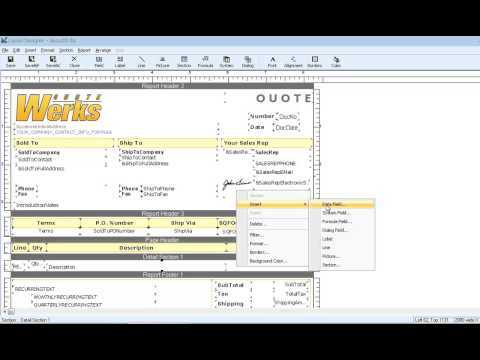 Demonstrates how to use the QuoteWerks Layout Designer to customize the printed lookup of your quotes. 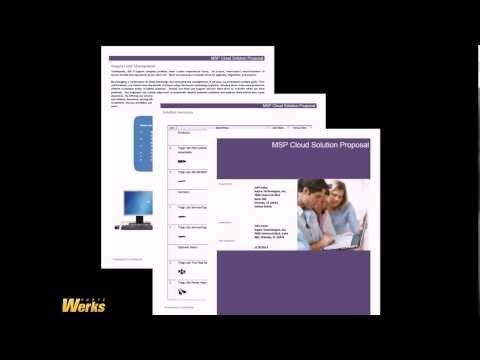 QuoteWerks can be used to create many documents in the sales process from Quote to Proposal. 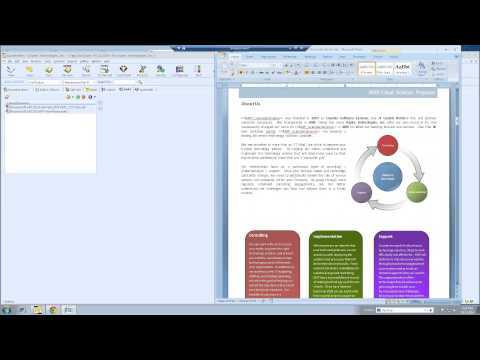 This video demonstrates how quickly and easily you can create a proposal with word editable items in QuoteWerks. 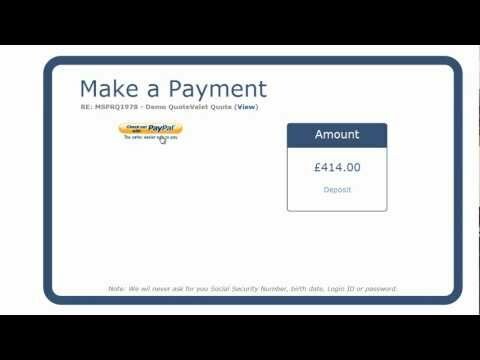 This video walks you through creating a profit amount formula on the QuoteWerks layout. This video walks you through modifying your layout to use Heading Lines to divide your quotes into sections. 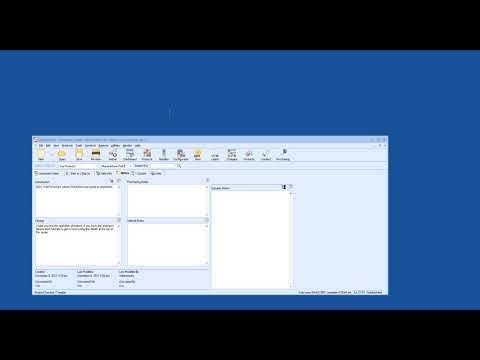 This video demonstrates a technique for creating page breaks in the QuoteWerks Layout Designers for printed/emailed documents using special line items in our quote. 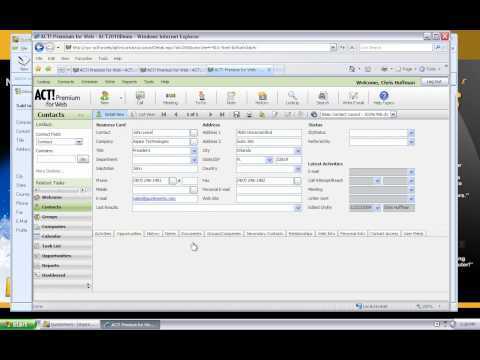 Demonstrates the QuoteWerks integration with QuickBooks. 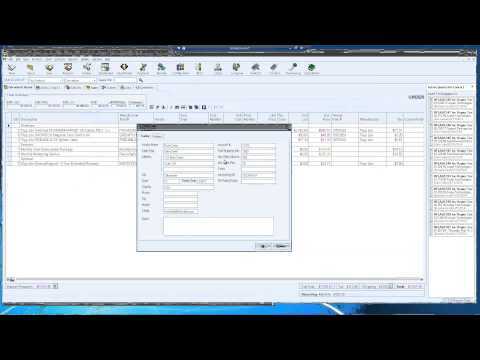 Demonstrates how to setup and configure the QuoteWerks QuickBooks Accounting Integration. 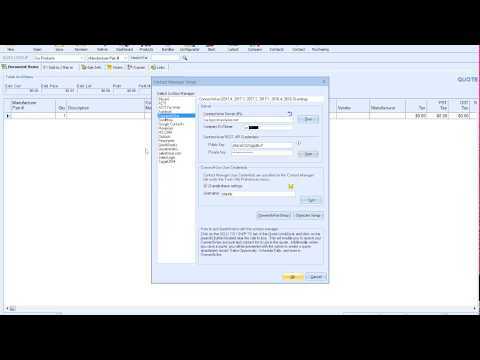 Demonstrates the QuoteWerks integration with QuickBooks Online creating an Invoice. 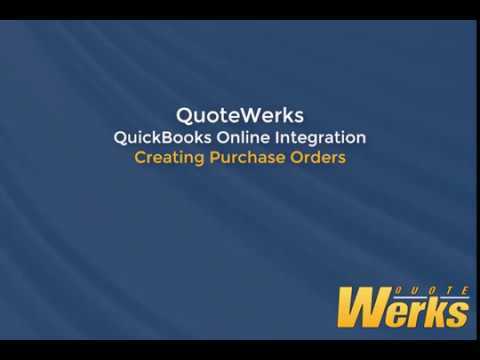 Demonstrates the QuoteWerks PO integration with QuickBooks Online. 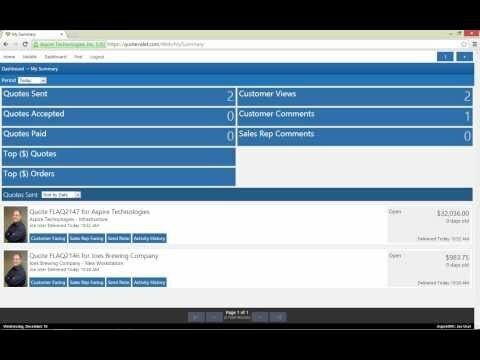 Demonstrates the QuoteWerks integration with Peachtree. 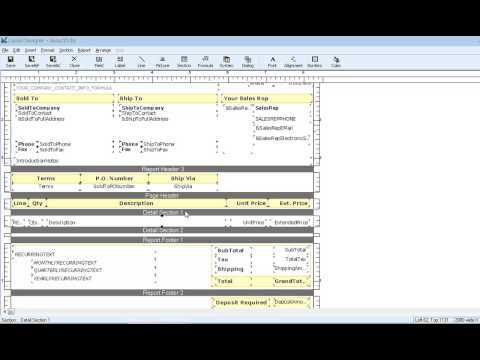 Link item quantities to each other using the Set Dependent Quantity feature. You can link a parent item to one ore more child items and when the parent's quantity is changed, the child items will automatically be updated to keep the original quantity ratio. Include labor charges with line items! Link a labor charge as a line item to a parent item so that when the parent's item is changed, the labor quantity automatically changes with it. An overview of Dynamic Notes on the Notes tab in QuoteWerks. You can easily insert a user's name and time and date with a push of a button! The Summary Lines feature includes the ability to total Section Headers in QuoteWerks. This makes it easier than ever to summarize recurring revenue in sections such as monthly, quarterly, and annual totals for a particular section. 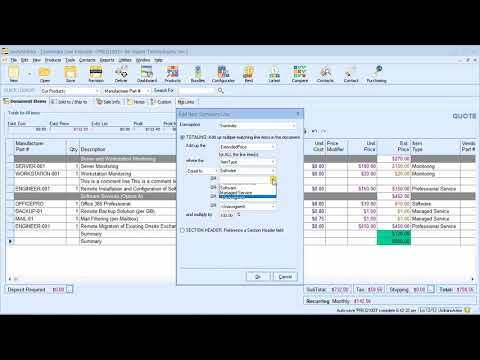 Demonstrates our sales tax rate lookup feature. 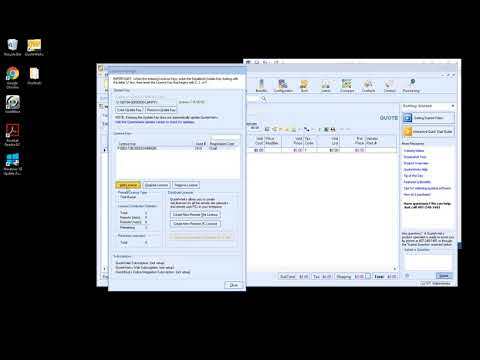 Demonstrates how to setup the QuoteWerks SMTP email client. 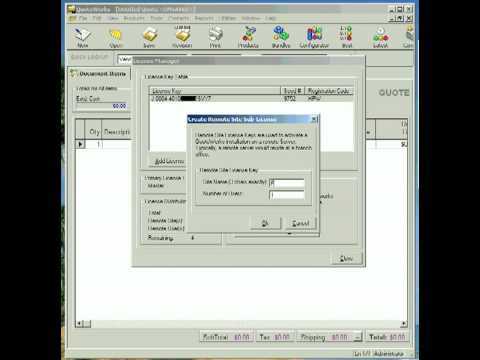 Demonstrates how to create a Remote Site License from the master QuoteWerks installation for use in a remote office/site installation. 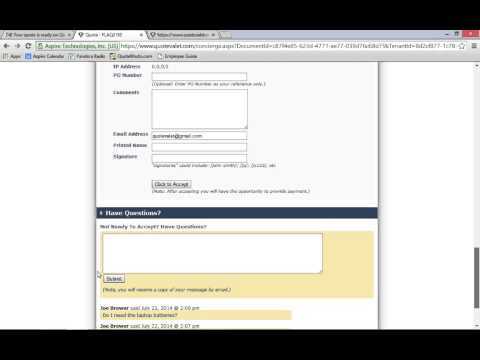 Demonstrates how to use the QuoteWerks HTML Email client. 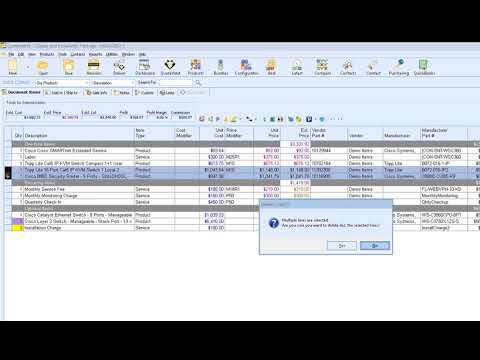 Demonstrates how to use the Select Special feature for quickly finding and manipulating line items that meet certain criteria. 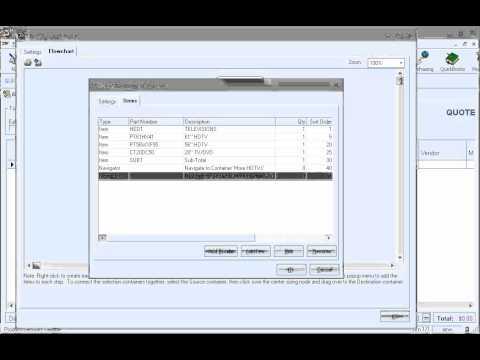 Demonstrates how to use Recurring Groups in QuoteWerks (Hardware as a Service / HaaS). When creating a new quote and selecting the contact you are creating the quote for, any active quotes for that contact will automatically be displayed in the Active Quotes Panel. This Dashboard provides a high-level overview of your total dollar amount and number of quotes and orders from the current month, last month, and two months ago. 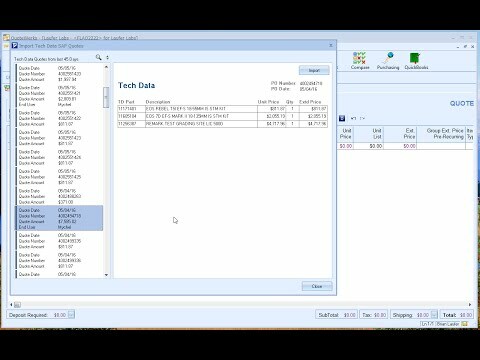 This Video will introduce you to the Manufacturer Part Number and Vendor Drop Down Menus on the Quote Workbook. The Manufacturer Part Number column on the Document Items tab supports a drop down list of part numbers. 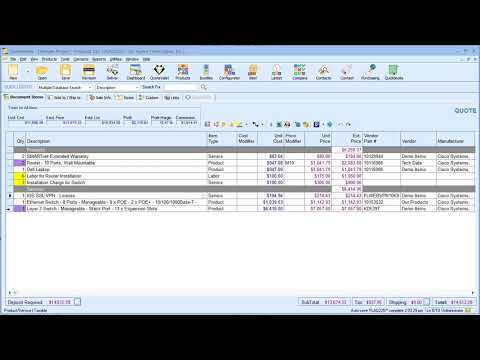 If the Vendor Column is empty, The Manufacturer Part Number column drop down will return a list of all products in the selected Quick Lookup Database. If you have a vendor specified on the same line, QuoteWerks will return that Vendor's database instead of the Quick Lookup vendor's database. 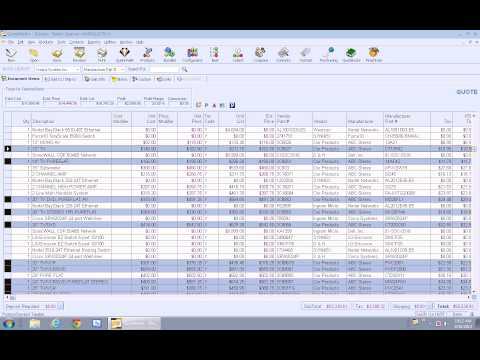 If you have a lot of items in your database and know what the part number begins with, you can type in the first few letters of the part number, hold down shift and click on the drop down. This will show you only the part numbers that begin with those letters. 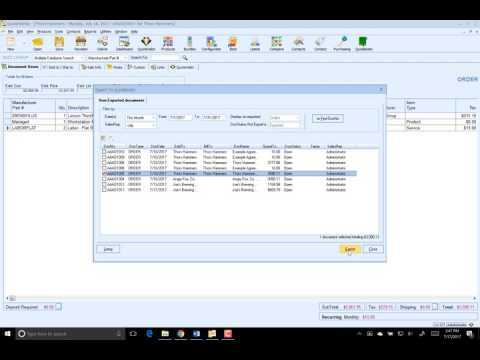 This short video demonstrates how you can easily drag and drop single or multiple line items in QuoteWerks. 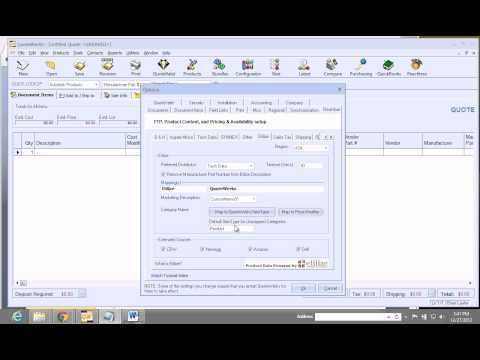 This video will walk you through how to add new licenses to QuoteWerks and then request and register these new keys. 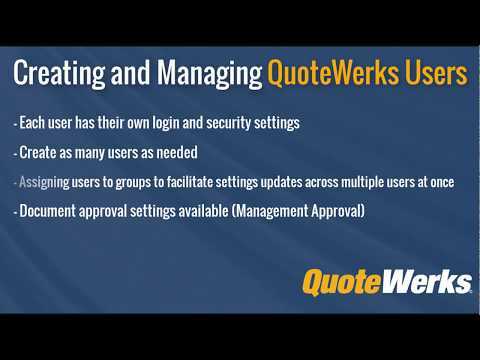 This video will walk you through how to create, edit, and manage your QuoteWerks users. Create templates in QuoteWerks to simplify the process of creating quotes or to help introduce new users to QuoteWerks. Creating and using templates is easy, efficient, and only takes a few minutes to set up. Never send out unauthorized documents again. 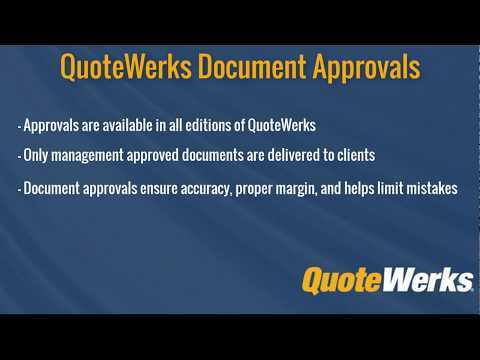 Utilize QuoteWerks Document Approvals to ensure your documents are accurate, within margin, and management approved before sending them to clients. 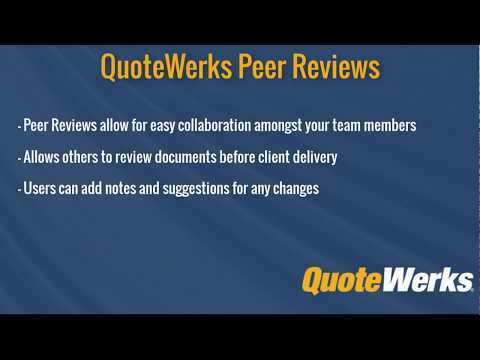 This video walks through how to use the QuoteWerks Peer Review to collaborate with other users in your installation. Users can post notes and offer suggestions on the document before it is delivered to the customer. 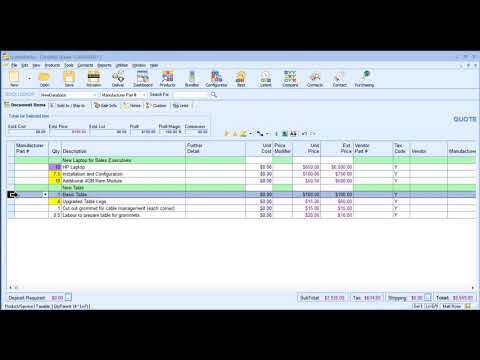 This short video will demonstrate how you can use Group Price Override to quickly and easily adjust the pricing of your bundles or groups to clean, round numbers without any complex calculations. 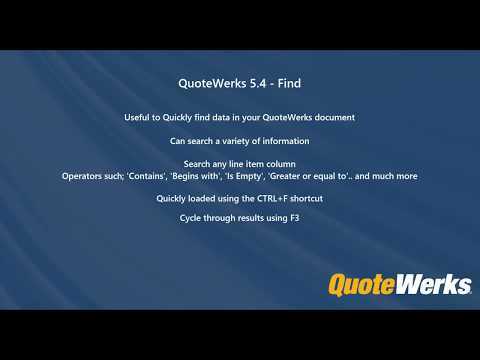 Easily search and find any text, number, or data in a Document Items field in QuoteWerks! 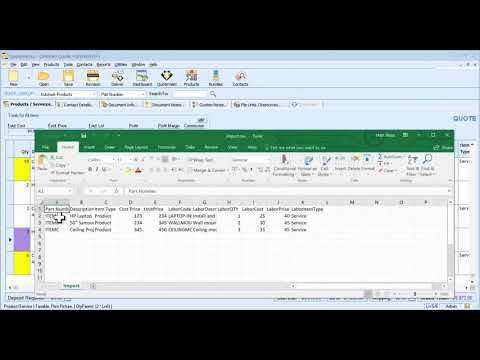 This video will demonstrate how easy it is to quickly and efficiently search and locate important data in your documents. 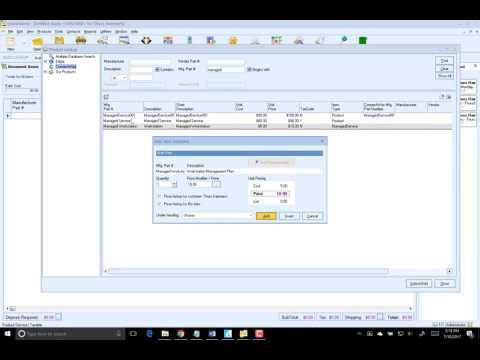 In this video, we use the Purchasing window to place an order with our distributor, Tech Data, then send the Purchase Order to QuickBooks, and lastly we retrieve real-time order status shipping tracking and serial numbers.. 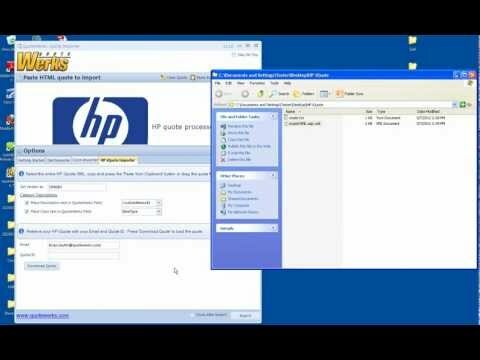 Demonstrates how to use the QuoteWerks Quote Importer to import quotes you create on HP iQuote. HP iQuote is HP's channel sales and quotation cloud service that ensures order accuracy, improves the efficiency of presales teams and reduces the risk of error. 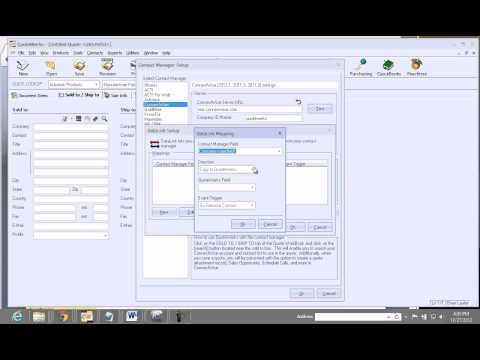 Demonstrates Purchasing Sourcing within QuoteWerks. A lot can happen in the 2 weeks between when you quote an item and when your customer wants to move forward with the order. Your cost can change, they don�t have it in stock at your preferred warehouse anymore (so it�s going to cost you more in shipping), or even worse, it is on back order for 3 weeks. With QuoteWerks, the real-time module, and the product content subscription, you can see all of your vendors at once with your pricing and availability before you place the order. 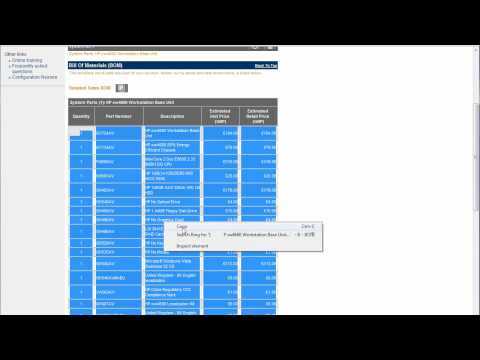 See how easy it is to select a Tech Data Quote from a list and create a QuoteWerks Quote. 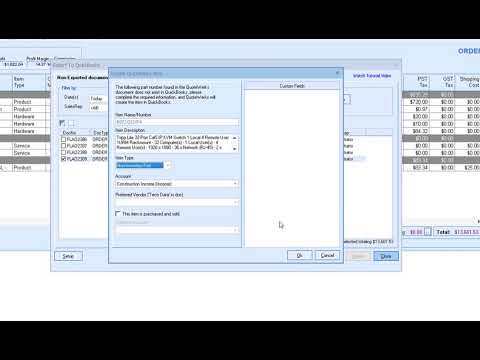 Watch this webinar where we demonstrate the newest features in QuoteWerks Version 5.0 Build 1! This release includes our brand new leasing integration with GreatAmerica real-time support, auto-links support, expanded Dell integration, multiple product database search, a new Opportunity Dashboard for forecasting, ConnectWise Sales Orders, and much more! 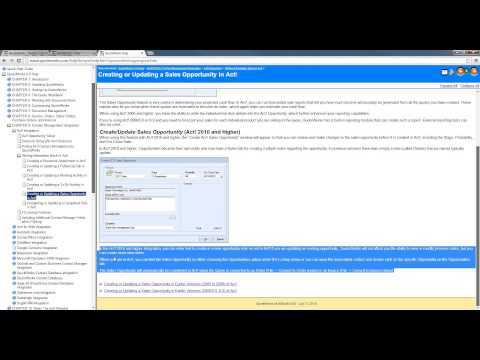 Did you know you can create a proposal document directly from the Links tab? Did you know you can attach documents to share with other QuoteWerks users? 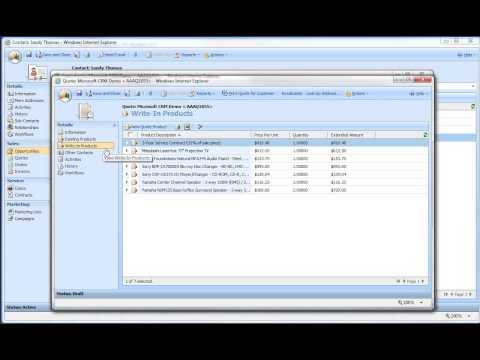 In this webinar, we discuss the capabilities of the QuoteWerks Links tab. We'll show you how to create proposals, use templates, email documents and more all from the Links tab! 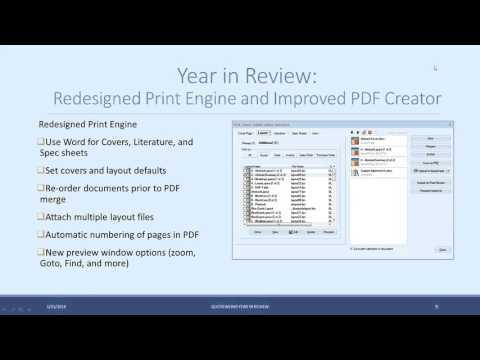 In this webinar, we demonstrate the latest features in QuoteWerks Version 4.9 Build 10. These new features include enhancements to searching for items using our new auto-fill system for part numbers, vendor selection options, free shipping minimum settings for vendors, and much more. 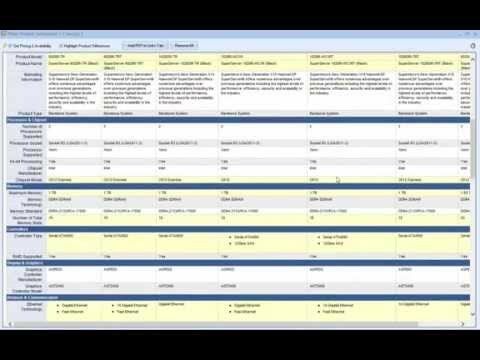 This QuoteWerks webinar provides an overview of the QuoteWerks Purchasing and Procurement features. 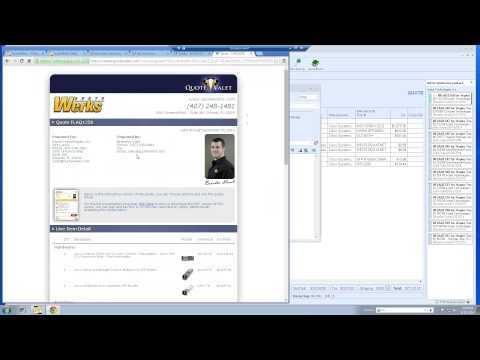 This QuoteWerks webinar provides an overview of QuoteValet and QuoteValet Web. Gary Pica of TruMethods along with Brian Laufer of QuoteWerks will share proven methods for pricing and packaging your IT service offerings. If you're recurring revenue is not increasing each and every month you need to hear what Gary has to say. 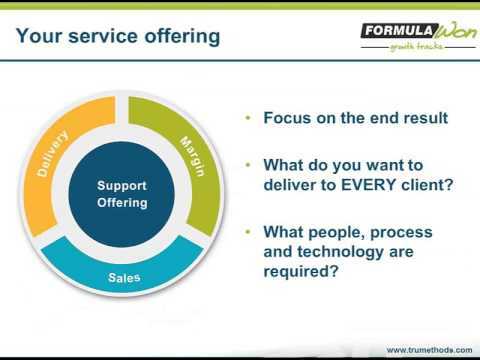 This webinar discusses the various training and support options QuoteWerks offers all of our customers. QuoteWerks has coordinated with The ASCII Group to have one of their community experts - Ken Galenza, a 27+ year credit and collections veteran, speak on the subject. 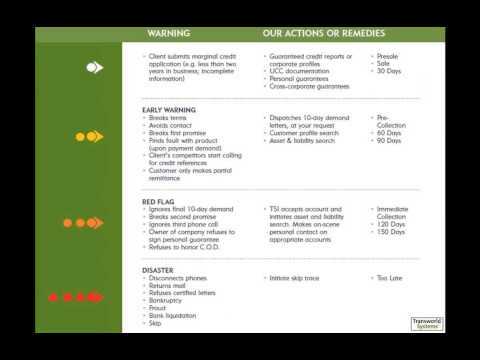 In this webinar, we tackle the topic of cash flow and collections - the do's and don'ts. It's vital for every company to create a process for receivables on how to handle clients are who late in paying their bills. 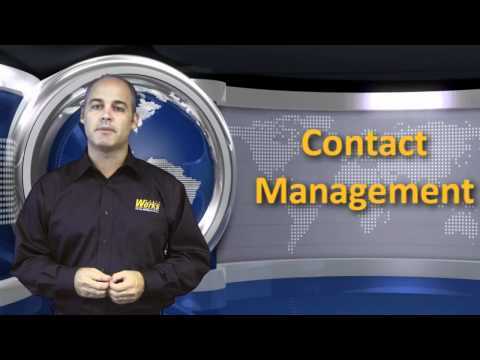 This is a situation nearly every business faces at one time or another, and Ken will show you a receivables system you can put in place as well as timelines and tips on how to broach the subject when you have a late-paying client. The QuoteWerks Version 4.9 Build 1/2 release includes over 80 new features, including QuoteValet Web, QuoteWerks Scripting, Undo / Redo, QuoteWerks Dashboard, Google Contacts, ConnectWise Purchasing Integration, and much more. 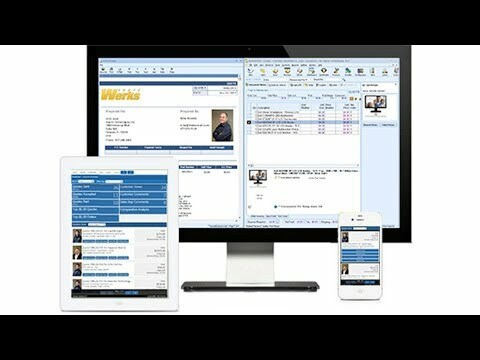 The QuoteWerks Version 4.7 Build 8 release includes over 20 new features including new email functionality, a new real-time partner (Comstor / Westcon Group), and additional Product Content (Etilize) functionality. The QuoteWerks Version 4.7 Build 2 release includes over 38 new features including Links tab and PDF file improvements, QuoteValet enhancements, QuickBooks enhancements, Purchasing window enhancements, and ConnectWise functionality. 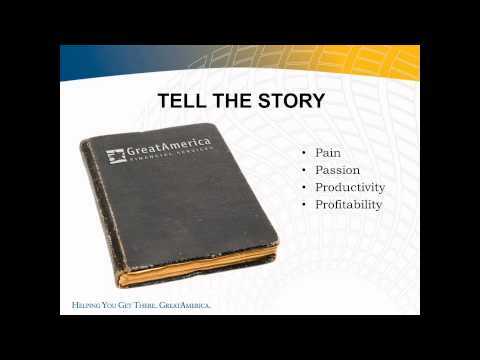 View customer testimonial videos on our Customer Testimonials page. View our tips & videos on our Tips and Tricks Playlist on YouTube. By Matt Rose from Quintadena, Ltd. the 2006-2012 QuoteWerks WorldWide Number 1 Solution Partner. By Matt Rose from Quintadena, Ltd. the 2006-2012 QuoteWerks WorldWide Number 1 Solution Partner. 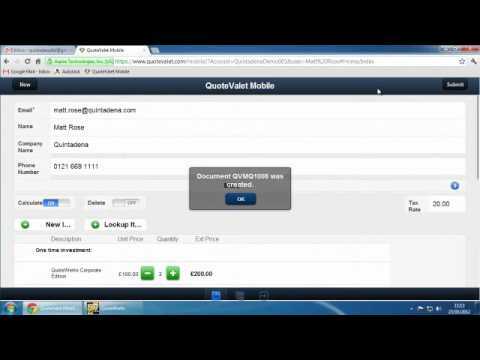 Covers creating a QuoteValet Mobile quote and retrieving it into your QuoteWerks installation. By Matt Rose from Quintadena, Ltd. the 2006-2012 QuoteWerks WorldWide Number 1 Solution Partner. 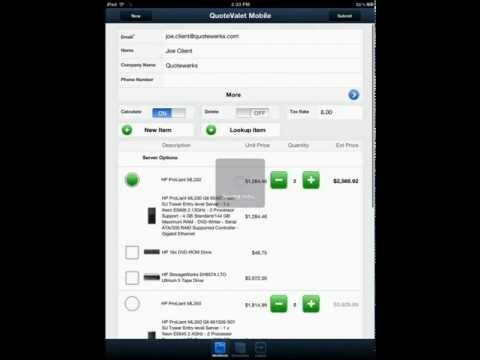 Covers QuoteValet payment processing including using deposit request feature from the customer and sales rep perspective.